Very few anglers can say they’ve nearly caught a 40-pound bag, especially in a tournament. And among those that have, it’s safe to say very few have lost that tournament. 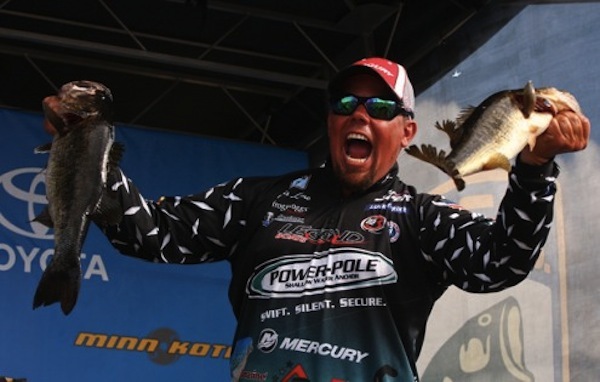 Chris Lane had little trouble winning his sixth Elite Series event after he brought a bag weighing 37-9 on Day 2 of the St. Johns River event. Prior to him weighing in, the tournament was really anyone’s, especially with almost half the field fishing the same area. But when he brought in that sack – which weighed more than what 58 anglers caught all tournament – Lane made it a tournament for second. Things are going to change tomorrow, as a 2012 Elite Series event is going to drop off (a tournament in which Lane finished second), but right now Lane is sitting in 82nd after his win – a 13-place jump. But he will slip back tomorrow some after that tournament drops. Speaking of drops, Kevin VanDam is in jeopardy of dropping out of the top 10 for the first time since Bass Rankings launched. He slipped to seventh after his consecutive-checks streak came to an end over the weekend, and he finished eighth in that 2012 event at Okeechobee. Where VanDam normally resides are two new top-5 anglers – Randall Tharp and Aaron Martens in fourth and fifth, respectively. Meanwhile, Ott Defoe is back in the top 10, while Edwin Evers slipped out of it into 11th. And that’s just all the shifting in the top 10, and as we said, tomorrow things are going to get shaken up again.